I don't often post single swatches any more, but I have some gorgeous polishes lying around that need a place on my blog! This one is Speckled Mint by Sportsgirl, an Australian clothing shop that's apparently kind of like Topshop, and Nail It! is their nail polish range. This was sent to me by lovely Hannah of Polly Polish! The mint creme base of this makes me think of melted mint ice cream! It's packed full of multi-coloured square glitter confetti pieces and tiny micro glitter. I'm a complete sucker for a mint green, Hannah couldn't have picked better! The formula is a little on the runny side but that actually just made it easier to apply. I used 2 coats and top coat. This polish is just... out of my mind! amazing! *. * looks so wesome on your nails! This polish is so cute! Lovely! Such a fun polish! i love all those colorful glitters! Lovely base colour. The glitter is really beautiful too. 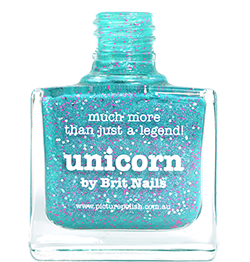 this polish is incredible ive got to get some!